The 2019 Toyota Avalon made its debut last month at the 2018 North American International Auto Show. This new fifth-generation Avalon has received an all-encompassing makeover with special focus on authenticity and exhilaration. New standard features on the 2019 Toyota Avalon are Apple CarPlay and dynamic auxiliary turn signals as well as passive and active safety benefits through the Toyota Safety Sense P (TSS-P) system. Available new features include authentic Yamaha wood and aluminum cabin accents, engine sound enhancement and Adaptive Variable Suspension (AVS) for superior driving dynamics. The new Toyota Avalon’s dimensions have been expanded for a longer, lower and wider body. New exterior styling such as sculpted deep draw side panels and a distinct carved lower rocker panel, make this model more athletic than ever before. Styling enhancements to the front grille identify model grades with differences in grille colors and borders. For example, Avalon XSE models will have a piano black mesh grille while XLE and Limited models have a dark gray front grille with a chrome border. 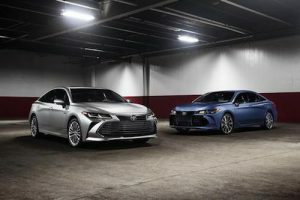 New 2019 Avalon models will be offered with a choice of two engine types, a punchy 3.5-liter V6 engine or a a 2.5-liter Dynamic Force four-cylinder Toyota Hybrid System II. The V6 engine delivers more power with less fuel consumption than ever before. The four-cylinder hybrid system utilizes a 650-volt electric motor and Continuously-Variable Transmission (CVT). Our Toyota Dealership in Rochester, New Hampshire is expecting delivery of the new 2019 Toyota Avalon in time for late Spring, early Summer sales. If you would like to learn more about this exceptional new Toyota sedan please contact us.